We the People was a platform through which people could exercise one of their fundamental rights as an American citizen – petitioning their government. Running a petition could help inspire real change – just check out some of our petition creator’s success stories – and it was also an opportunity to connect with a community of people equally as invested in making a difference. 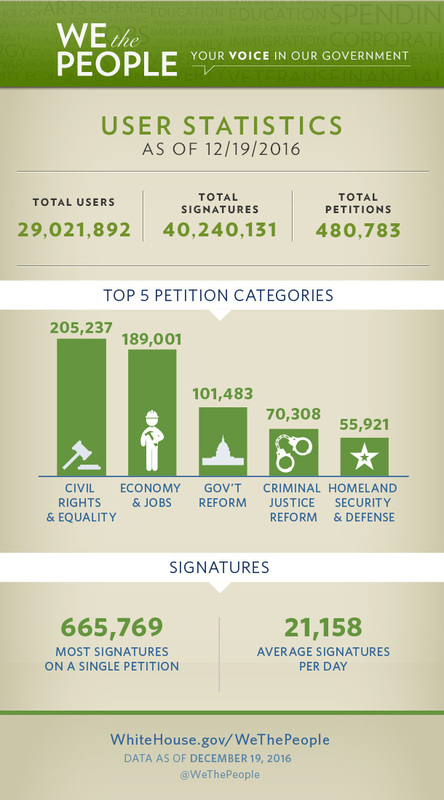 From its founding in September 2011 to its closure in December of 2016, We the People gathered approximately 480,000 petitions, 29 million users, and 40 million signatures. Q: I’m having trouble signing in or creating an account — what should I do? Click here and enter your account information. You will receive an email within a few minutes asking you to click on a link to verify your email address. Click on the link in the email (or cut and paste it into your web browser). Once you have verified your email address, you’re logged into the system. Note: Just signing a petition? No need to create an account. Simply go to the petition you'd like to sign, enter your information, and verify your signature. Q: How does We the People work? Q: Who can participate in the We the People platform? Anyone 13 or older can create or sign a petition on WhiteHouse.gov. In order to participate in the We the People platform on WhiteHouse.gov, users must create a WhiteHouse.gov account and verify their email address. Q: How will the White House decide which petitions to respond to? The White House plans to respond to each petition that crosses the current signature threshold, which you can view on the Terms of Participation page. In some cases, the White House response might not address the facts of a particular matter to avoid the appearance of improper influence (such as in specific procurement, law enforcement or adjudicatory matters). In addition, the White House will not respond to petitions that violate We the People’s Terms of Participation. In some cases, a single update may be used for petitions on similar topics. Q: Will the White House ever change the threshold for petitions responses? The threshold may change. The We the People platform is the first time the Administration has attempted a project like this. As more people use this tool to tell the White House about the issues that matter to them, we may find that we need to adjust the signature thresholds for petitions to appear publicly on the site or for petitions to receive an update from the White House. New signature thresholds will only be applied to petitions created after the changes are made. You can always view the current signature thresholds on the Terms of Participation page. Q: Will the site be moderated? Yes. For more information, please see our Terms or Participation. Q: Will petitions ever be removed from the We the People platform? Consistent with the Moderation Policy, petitions that are determined to violate the Terms of Participation will be removed from the site. Users who have a petition removed are welcome to create a new petition that complies with the Terms of Participation. Petitions will only be removed under the Moderation Policy — no petition will be removed because of the viewpoint it expresses. Q: How long will it take for the White House to respond? We will do our best to respond to petitions that cross the signature threshold within 60 days, however, depending on the topic and the overall volume of petitions from We the People, responses may be delayed. Q: Is We the People the only way to contact the White House? No. We the People does not displace any other options for people to contact the White House. If you prefer not to use this tool, there are plenty of other ways you can contact the White House. Learn more at obamawhitehouse.archives.gov/contact. Q: If a petition isn’t viewable until it reaches 150 signatures, how will people know about it? When a petition is first created, only the petition creator will have the URL of the petition. It’s up to the petition creator to share the petition (and URL) with others who care about the issue to build support and gather more signatures. Once your petition is published, you can use the share icons on the page to easily send the petition via email and your social networks. Once a petition gathers the minimum number of signatures, it will be findable on the We the People platform. Q: Who will review and respond to petitions? The White House will ensure that petitions that cross the signature threshold make their way to the right policy folks across the government (whether they’re in a White House office like the Domestic Policy Council or at a federal department or agency). The We the People team will post a response – and any updates – are posted as quickly as possible. Petition updates may come from a variety of Administration officials, including staff at the White House. Q: How will the White House handle duplicate petitions on the same topic? Creating duplicate petitions in the system decreases the likelihood that a petition will receive a response from the White House. While the White House will not combine similar petitions, one update may be applied to multiple petitions on the same topic. By participating in We the People, you acknowledge that you have read, understood, and agree to be bound by these Terms of Participation and to comply with all applicable laws and regulations. We the People expands the options for contacting the White House and does not displace current official methods of communication, such as mailing or emailing the White House. If you are not willing to agree to We the People’s Terms of Participation, but want to send a message, petition, or other form of communication to the White House, you may do so through the White House Office of Correspondence, which maintains a contact form and information about communicating with the White House at obamawhitehouse.archives.gov/contact. You also agree that your user-generated signature or account information will not contain threats of unlawful violence or harm to any individual or group; obscene, vulgar, or lewd material; defamatory or fraudulent statements; terms commonly understood to constitute profanity or abusive or degrading slurs or epithets; information invading an individual’s privacy; and information that if published would violate criminal law or give rise to civil liability. The White House may disable user accounts, remove associated signatures and remove petitions created or signed by users that it has reasonable belief do not satisfy the above rules. Outside of these circumstances, the White House will not entertain requests to modify the language of a submitted petition or to remove a signature from it. The White House may block access from IP addresses that it has reasonable belief are using automated systems or bulk processes to create multiple user accounts or petition signatures. The White House may also block submission of disposable or time bound signatures. You agree that the White House can send you email updates related to We the People. This includes, but is not limited to, system-generated emails used to verify your email address, updates on the progress of a petition you created or signed, and official responses to that petition. In addition to emails related to We the People, you can also choose to receive additional email updates about other topics. You can always unsubscribe from future White House email by clicking on the “unsubscribe” link at the bottom of any WhiteHouse.gov email. Learn more about email subscriptions and updates. You agree to only create petitions consistent with the limited purpose of the We the People platform, which is to allow individuals to petition the Administration to take action on a range of issues — to address a problem, support or oppose a proposal, or otherwise change or continue federal government policy or actions. To focus discussion, the platform is limited to a discrete set of topics, which may be adjusted over time. Petitions that do not address the actions or policies of the federal government, or that address a topic not included in We the People at the time the petition was created. The White House will respond to petitions submitted through We the People that comply with these Terms of Participation and reach the second signature threshold listed below. Petitions on We the People must meet the first signature threshold in order to be publicly searchable on WhiteHouse.gov. Petitions that do not meet these signature thresholds will be removed from the site after the time limit has expired. The White House may elect to respond to petitions at any time, including those that have not crossed the first or second threshold. To avoid the appearance of improper influence, the White House may decline to address certain procurement, law enforcement, adjudicatory, or similar matters properly within the jurisdiction of federal departments or agencies, federal courts, or state and local government in its response to a petition. Where possible, we will notify signers of petitions whose content falls into these areas, in instances in which we don't feel we will be able to respond meaningfully. Participation in the We the People platform does not create any right or benefit, substantive or procedural, enforceable at law or in equity by any party against the United States, its departments, agencies, or entities, its officers, employees, or agents, or any other person. To cross the first threshold and be searchable within WhiteHouse.gov, a petition must reach 150 signatures within 30 days. To cross the second threshold and require a response, a petition must reach 100,000 signatures within 30 days. The Terms of Participation were last updated on March 7, 2016. In August 2014, President Obama signed a bill that ensured consumers could use their mobile devices on the network of their choice. This marked the first time that a We the People petition led to a legislative change. Read the August 15, 2014 blog post. Read the petition and the official White House response. Moved by the tragic suicide of a transgender teenager whose parents had forced her to attend conversion therapy, citizens used a We the People petition to support a ban on the practice. In a response, the White House did just that, and President Obama threw his support behind state-level efforts to ban conversation therapy for minors. Prior to this response, the White House had not taken an official stance on the issue. Read the April 10, 2015 email and blog post from Amanda Simpson, Executive Director of the U.S. Army Office of Energy Initiatives on why conversion therapy is so harmful and why it was important for the White House to stand up against the practice. In early 2015, a petition called on the White House to award professional baseball player Lawrence Peter "Yogi" Berra the Presidential Medal of Freedom for his military service and civil rights activism. Later in the year, the White House proudly announced – including to signers of that petition –that President Obama had awarded Yogi Berra the Presidential Medal of Freedom, the nation’s highest civilian honor. Learn more about the Presidential Medal of Freedom, the highest civilian award of the United States, and the individuals awarded by President Obama.